Last month I talked about some projects I was planning. Some of the knitting projects are well underway, or even completed. 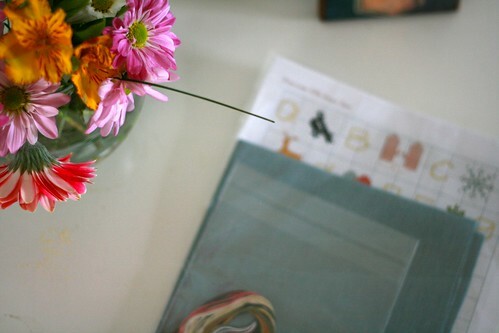 But the Winterwoods ABCs cross-stitch sampler kit, sitting prominently in the picture? Still sealed up so lonely in the package, the way it has been for months. Last night, my friend Ginny called me and suggested a brilliant idea. Why not do a stitch along for it? She thought we could start on the first day of autumn and stitch over the next 13 weeks, finishing by the first day of winter. She didn't have to ask twice. I was all in! A perfect project, and so doable. So we decided to open a Flickr group for anyone else who wants to join us for a stitch along of Alicia's extraordinary kit (it really is extraordinary -- the quality of the materials is amazing, and Alicia doesn't miss any details). It'll be low pressure -- no posting requirements. Just a way to share progress, keep motivated, and keep accountable. So that we can actually have the sampler hanging on the wall in time for winter enjoyment! If you would like to join us, all you need to do are order the kit (or you can also buy just the pattern and obtain your own materials), and join the Flickr group. Though Ginny did contact Alicia last night to make sure this was OK with her (and she gave the project an enthusiastic "yes! "), we are not affilated with her, so we don't get anything if you buy your supplies from Alicia. That said, for the sake of convenience and quality, I don't think you can go wrong getting any other supplies you might need (needles, hoop, even scissors!) from her. Alicia rolled out her new shop in the last week and it is really well organized and lovely! Ginny's post this afternoon has a few more details and links, so be sure to check there, too. I hope you'll join us!